Find answers to the most frequently asked questions about our Internship Programme. For any further questions, please get in touch. If you’re a graduate looking to kick start your career in the not for profit sector or a student searching for a placement in a national charity. Or maybe you’re interested in changing career. If so our internship programme at the RNIB is the right fit for you! We’re looking for someone who has a pro-active nature and is interested in making a positive and real life impact on the lives of people with sight loss. We encourage applications from diverse backgrounds and people with disabilities. In order to apply, you will also be required to be a UK resident for the duration of the internship. We recruit interns all year round. However there will be some periods during which we will be recruiting for a wider number of interns. You can check all of the volunteer internships available in your region on our website. In order to apply, you will need to create an account on our system and complete a series of questions. We are unable to accept CVs and covering letters. If you would like the application form in a different format (such as standard print, large print, braille or audio) or if you have any further questions, contact the Volunteering Team by emailing [email protected] or calling 01733 375450 . The duration of our internships is 12 weeks and on average would consist of the intern volunteering for three to four days per week. However, the weekly time commitment may be negotiable with the manager of the opportunity. Where do our internships take place? Our range of Internship opportunities takes place across of the UK according to availability. No, all of our internships are voluntary positions. You will be entitled to claim reasonable expenses for lunch and travel on production of receipts. What does the recruitment process looks like? Most internships will be advertised for a two week period. Once the vacancy is closed, the manager will invite all shortlisted candidates to an interview. You will be assessed on skills and competencies relevant to the internship role you have applied for. Does completing an internship lead to employment? No, completing an internship doesn’t lead to employment in the organisation. However, you will have access to our current internal vacancies and are encouraged to apply for a job with us. Your manager will also be able to provide you with a reference upon request and completion of your internship. If you have any further questions, please get in touch with the Volunteering team by emailing [email protected] or by calling 01733 375450. What is it like to be an intern? 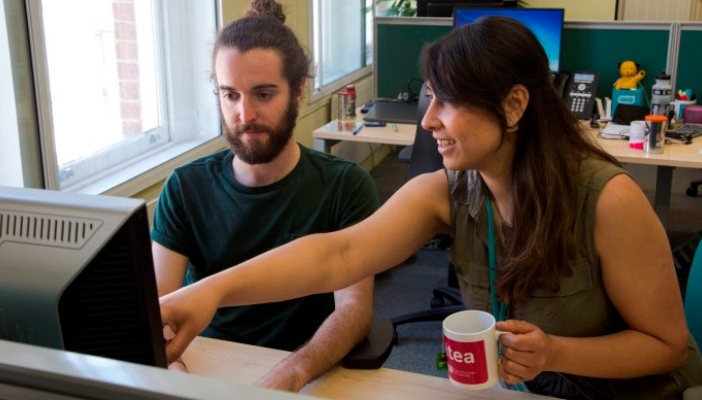 Find out what to expect from an internship with RNIB. Our recent interns and their managers share their stories. Apply for our latest internships.